I laughed the laugh that I’m normally mortified to laugh in public. From the setting in the back room of Moran’s to the natural, open performance by Nonie Stapleton Charolais had the audience laughing and groaning in empathy with the character of Siobhán throughout. Stapleton’s portrayal of each character, directed by Barbara Ní Chaoimh, was delivered with skilled characterisation, with the amorous French heifer coming to life just as engagingly as Breda the crotchety mother in law or the long suffering Siobhán. It was the little things that made the performance so impressive, like the the moo-ing moments in singing songs as the Charolais, the wry smile of Siobhán and the tight lipped disapproval of Breda. The performance was built on the solid foundation Stapleton’s of well-paced and evocative writing, again bringing the characters and stories to life with vivacity and sagacity. 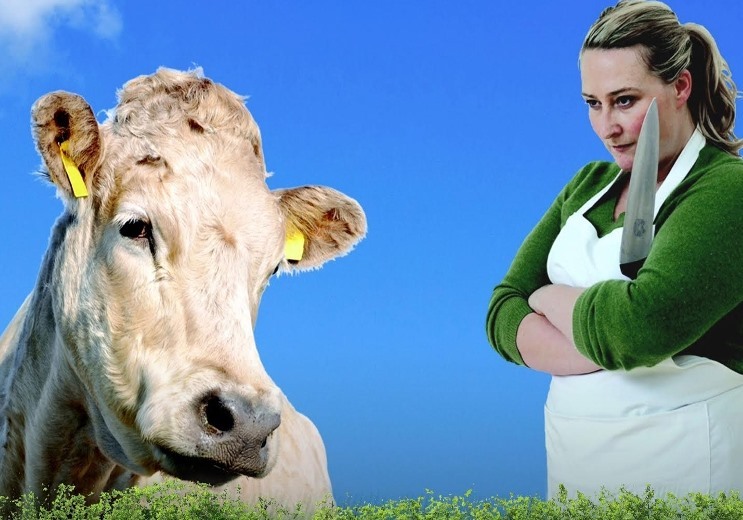 Charolais is an hilarious, and sometimes heart-wrenching, tale of the age-old rivalry between between the wife and the mistress…with a bovine twist! This entry was posted in Review and tagged Barbara Ni Chaoimh, Charolais, Clonmel Junction Festival, Nonie Stapleton.